An Unusual Pair of French Bronze and Brass "Canon" Candlesticks No. 4319 - C. Mariani Antiques, Restoration & Custom, San Francisco, CA. 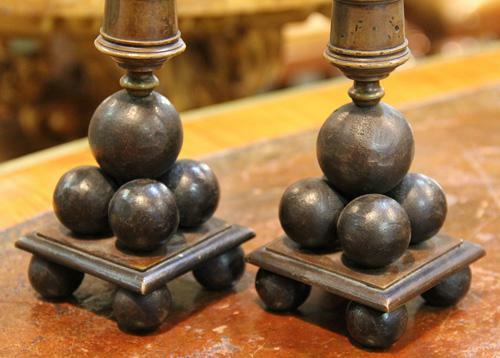 An Unusual Pair of French Bronze and Brass “Canon” Candlesticks, circa 1810, artfully depicting cannons and cannon balls and actually made from melted armaments (including canons and cannonballs) from England, part of the spoils France confiscated during its wars with England continuously from 1793 to 1802. Height: 12"; Width: 3"; Depth: 3"